Alto's signature feature is "Stacks," a system for sorting incoming emails. The tool works like a filter, automatically pulling in emails based on sender or other types, and places them in icons that appear in the inbox view. Alto is a new web-based email service that syncs up to five email accounts through a highly visual system -- and you don't even need an AOL address to use it. It's designed to minimize "inbox fatigue": those seemingly endless email threads, daily deal notifications and newsletter subscriptions most of us have strewn across multiple accounts. Alto streamlines all of your inboxes into one and sorts messages into a more visual format. Right now, the service can sync as many as five email accounts: Google's (GOOG) Gmail, Yahoo (YHOO) Mail, AOL Mail, and Apple's (AAPL) @mac.com and @me.com. AOL executives say they'll add more platforms eventually. Users simply log in to Alto with their username and password for one of those supported accounts, and then add as many as they'd like -- no AOL (AOL) address is necessary. New users can sign up for an invitation at altomail.com. "People need a new email address like they need a hole in the head," David Temkin, AOL's senior vice president of mail and mobile, told CNNMoney in an interview. "What they need is an email service that addresses the way we use email today." To AOL's product team, that meant focusing on two key points: quick organization, and a stylish, ad-free design that Temkin said was "created with the iPad in mind." Email "stacks": Alto's signature feature is "Stacks," a system for sorting incoming emails. The tool works like a filter -- automatically pulling in emails based on sender, recipient, keywords, etc. -- and places messages in icons that appear in the inbox view. "We wanted to pass the 15-foot test: Someone looking at the screen from far away would say, 'Hey, that looks cool,'" said Josh Ramirez, AOL Mail's senior product director. New stacks are created by dragging and dropping emails. Alto also creates some stacks automatically: Photos, for emails with any in-line or attached images (excluding newsletters); Attachments, which lets users preview thumbnails or view documents without opening a new program; Social Notifications, for sites like Facebook (FB)or Twitter; and Daily Deals, which includes coupon emails from sites like Groupon (GRPN) as well as retailer newsletters. "Email used to be a happy thing: you've got mail!" Temkin said. 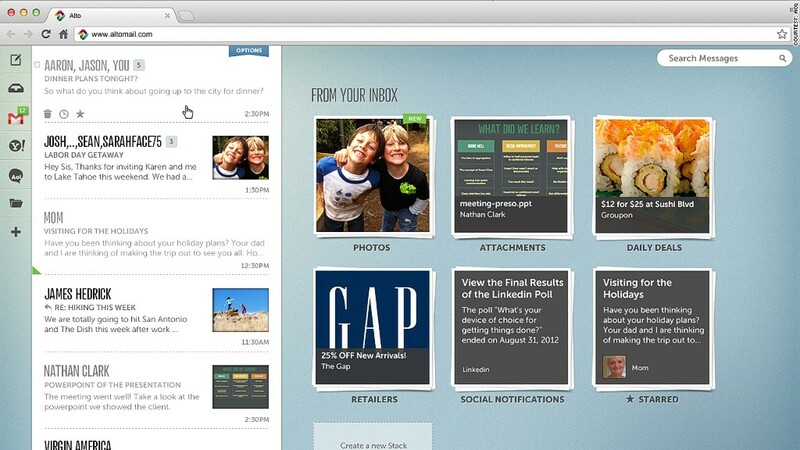 "Now email feels like you can't get away from it. People feel like it's an unsolvable problem -- and that's what we're trying to fix. This keeps you from having to triage your inbox." Users can opt to send some emails straight to a stack by clicking "skip the inbox," an option Ramirez said was created with daily deals in mind: "Email has been built around recency, the newest message, but chances are the Groupon email that just came in is not the most important thing to me." Other cool stack features include a visual analytics display that looks a lot like Intuit's (INTU) Mint. Alto analyzes the emails categorized into a given stack for the last 30 days: how many messages were received and sent, how many went unread, and how many came from each sender. Also, stacks can swap places based on which have received new emails -- or users can "pin" stacks to keep them in their place. Visual search: The AOL executives stressed Alto's search capabilities, which let users look for contacts or keywords across all synced email accounts. Clicking on a contact's name pulls up a slew of information from email and social accounts: recent messages, the stacks with which that person is associated and their general contact information. If you link up your social media accounts, Alto will also drops in links to your contacts' accounts on sites like Twitter, Facebook and LinkedIn (LNKD). Not making money yet: Alto offers a new look and cool features, but one big question remains: How does AOL make money on the service? Unlike its main rivals -- Yahoo Mail, Google's Gmail and Microsoft's (MSFT) recently revamped Outlook (formerly Hotmail) -- AOL's Alto currently carries no advertising whatsoever. "The initial release has no revenue generating features at all," Temkin said. AOL isn't planning to monetize Alto until sometime next year, he added. He doesn't want the service to be "cluttered up" with banner and text ads, he said. Instead, Alto may feature sponsored stacks or ads within stacks themselves. Alto is, in part, the result of lessons from "Project Phoenix," an experimental web-based email system AOL launched in 2010. Phoenix taught AOL two things, Temkin said: First, that AOL's core userbase is "deeply entrenched" and doesn't want something "radically different." Translation: That clunky "You've Got Mail!" greeting is here to stay on classic AOL Mail. The other thing AOL learned from Phoenix: Users weren't into the idea of signing up for new email addresses on the domains AOL made available, like @ygm, @games, @wow, and @love. So AOL decided it would keep AOL Mail, but also create a new product -- which is how Alto came to be.